Sherwood J. Franks, 93, of Cary, died Wednesday, December 20, 2017 at his home in Cary. Sherwood was born September 14, 1924 in Wake County, NC to the late William Blaney Franks and Alma Jones Franks. He was a WWII Navy veteran and was awarded the Bronze Star. He owned Franks Insurance Agency as a Nationwide representative in Apex for over 30 years. He served as president of the Wake County Gideons, Apex Rotary Club and Apex Chamber of Commerce. He was a leader in Bible Study Fellowship and a member of Christ Baptist Church in Raleigh. Sherwood Franks was a dedicated servant of our Lord Jesus Christ until the end. Sherwood was preceded in death by his wife of 71 years, Doris Haley Franks. 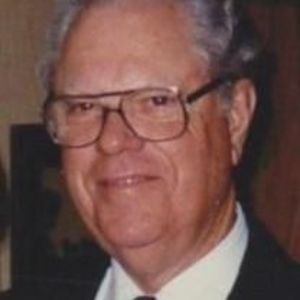 He is survived by his four daughters, Dianne Bode (George), Gail Bridgers (Robert), Mary Rose Eason (Carl) and Darlene Smith (John); nine grandchildren; eleven great grandchildren; and two great great grandchildren. A funeral service will be held 11am Saturday, December 23, 2017 at Christ Baptist Church, Newton Rd, Raleigh, NC 27615. Burial will follow the service at Raleigh Memorial Park. The family will receive friends 10-11am prior to the service at the church. Memorials may be made to the Wake County Chapter of Gideons International and Bible Study Fellowship.